The familiar excitement of competition season has once again descended on Team 341 with our first event, the Hatboro-Horsham District in Horsham, PA.
For the past 5 seasons, this event has been Miss Daisy’s first stop on our competition tour, before venturing out to other districts and regionals both near and far in later weeks. 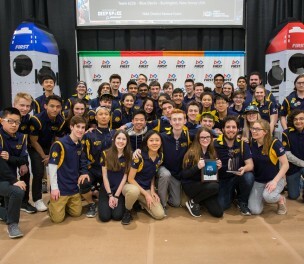 This event is always a team favorite, because it affords us the chance to be among the first batch of teams to play the new FRC game in week one of the competition season, and being 5 minutes away from Wissahickon High School means that it’s also a great opportunity for team parents and interested students to come watch us perform. 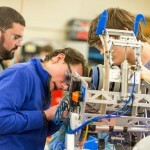 Similar to Ramp Riot, many Wissahickon students have wandered into the Hatboro-Horsham district over the years and discovered that the robotics team is something they’d be interested in joining. Miss Daisy has typically hit the ground running at Hatboro, taking home blue banners three of the last four years. Aspirations were high as the Day Zero crew loaded in on Friday evening that this event would be a successful start to 2016. After pre-assembling our pit display earlier in the week, and taking extra time to diligently label and organize crates and tool chests, we were pleased to be completely loaded in and inspected within 90 minutes of arriving at the venue. 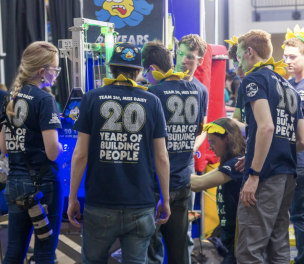 Late Friday evening, we were approached by event staff to lend support to another team who had arrived at the event with only a bag of parts. Exhibiting the spirit of gracious professionalism, coaches and students from several teams stayed past 11:00pm helping them assemble a working robot. Special thanks to Coaches Lou, Sean B., and Jenni for all of their hard work and dedication to make sure that a deserving team was able to field a robot. Great work guys. After wrapping up qualification matches with a record of 10-2 (!!!) 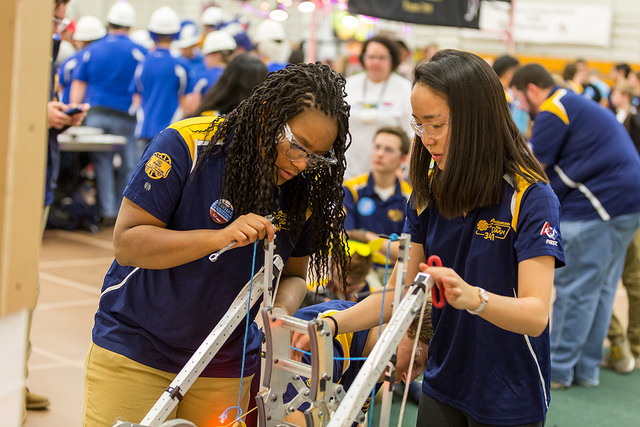 Team 341 was positioned as the fourth seeded alliance captain, and ended up being the first overall pick, selected by the first seeded alliance captain, our friends on Team 25, Raider Robotix. 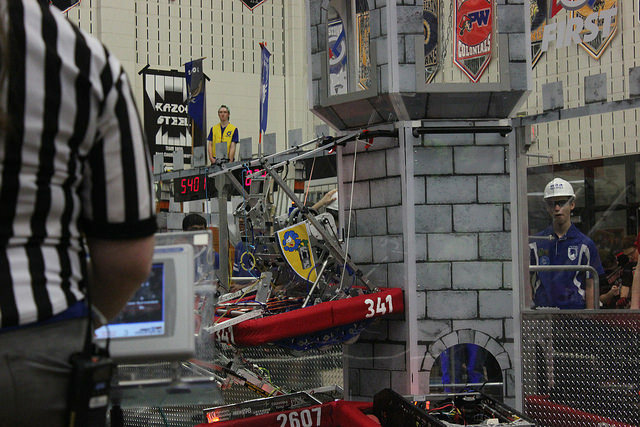 Elimination matches brought our alliance a number of mechanical challenges, and we fell to the eventual champion alliance of 1218, 2590, and 5407. While most plants spread FIRST spirit throughout the land, this troop’s quest required them to chop through obstacles to lift the spirits of an ailing squire. This chance meeting became an enduring alliance that sowed the seeds for a future team. This team builds people. 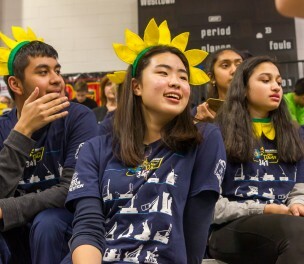 The judges award goes to, for cross pollination for FIRST spirit, Team 341, Miss Daisy from Ambler PA.
All in all, Hatboro proved to be a great showing for Daisy XV, putting up the most high goals and scaling the tower three times, and an even better showing for the team as a whole. Catch Miss Daisy XV next month from April 1st through 3rd at the Westtown District in West Chester, PA.